Brigadier J. C. Fischer (left) and Lt. Général Armentieres (center) atop a ridge in The Fulda Gap. Observing the Advance Guard approaching The Fulda River below. 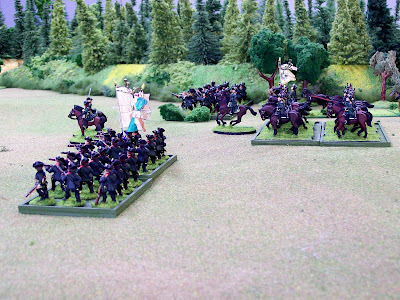 The Legion de Fischer leads the way with a screen of mounted dragoons looking across the river, backed by Chasseurs in mirlitons, a "Swedish" 4 Pd. 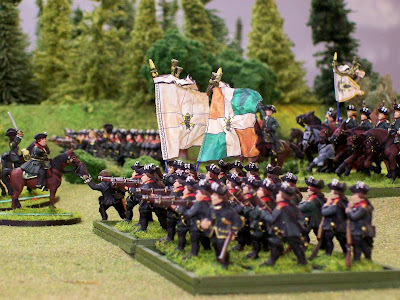 cannon and Grenadiers. Behind them are close order fusiliers ready for mischief. 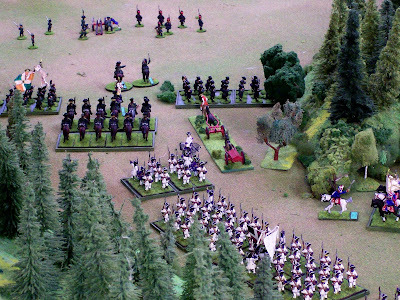 Four divisions of fusiliers and a second squadron of dragoons are in reserve. Aide Major de Infanterie Orbs gives orders to the two fusilier divisions on the left. No one yet knows what Legion de Fischer flags looked like. Flag Dude was given made-up specifications and colors as shown. While behind marches Régiment de Auvergne wearing distinctive violet collars and cuffs. It appears the Advance Guard will either encamp here or cross The Fulda in the center distance. 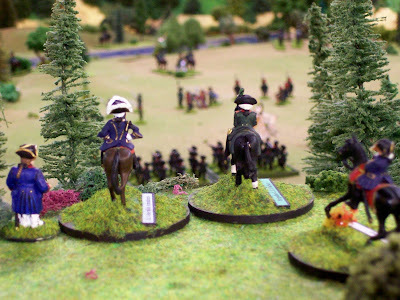 A compagnie of dragoons has already crossed. 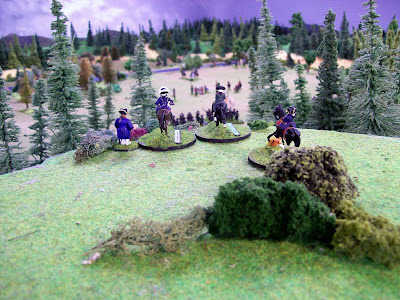 Auvergne's flank is protected by Bercheney Hussars. 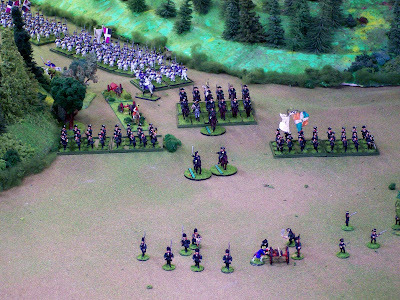 Turning around and looking from the other way we see the Gallian/French Advance Guard marching toward us. What are the plans of Armentieres and Fischer? Where are they going? 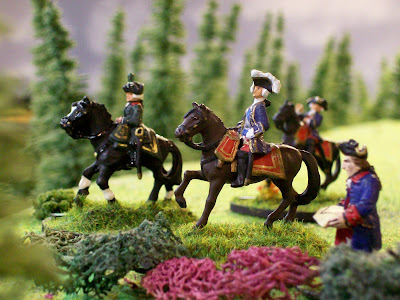 We can only guess they are leading the Army through The Fulda Gap into Hesse-Kassel. A courier arrives with some news. What will the message say? The Gallian commanding General Chevert is not far behind with the Main Body. Front Rank: Almost the entire Legion de Fischer and most of Bercheney. 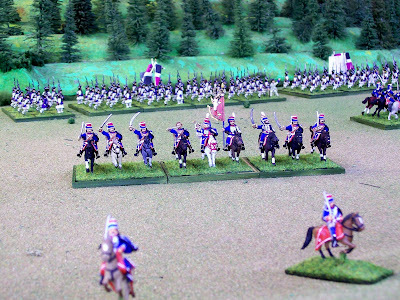 Elite Miniatures: Almost all of Auvergne, the cannon and the officer on a round base leading the dragoon squadron posted in reserve. Old Mini-Figs: The smaller Bercheneys, Courier, Chasseurs and Fischer himself. Redoubt: Officer with map and cannon crew wearing green. Garrison: Armentieres. He rides a Mini-Fig horse. RSM: The Royal artillery crewman with the 4 Pdr. Dixon: The officer with raised sword near Orbs. Flag Dude: All fictional flags for Fischer and historical ones for Bercheney. Terrain Guy: River and table covering. The different manufacturer styles with all their nuances appear not to matter if one observes the ensemble as a whole and if one considers we are not all six feet tall weighing precisely 165 pounds. A fun thing is to place officers from different manufacturers in various units solely for variety; tall, short, in between, thin, overweight, handsome or plain. This way they aren't all doing the exact same thing. 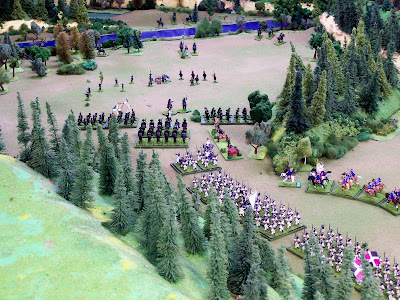 The green-clad infantry of Fischer's Legion have all kinds of officers. 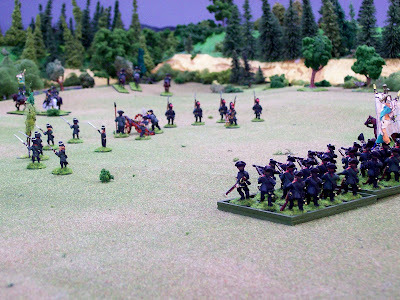 For example, one can go to Front Rank and obtain French officer varieties from the European range and also the French and Indian War range of miniatures. 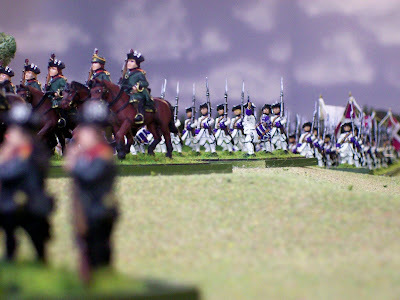 Why not also add Crusader, Dixon, Elite, Foundry and Mini-Fig French officers too? Variety makes things interesting. YOU can do the above too. Your remarks are welcome next.